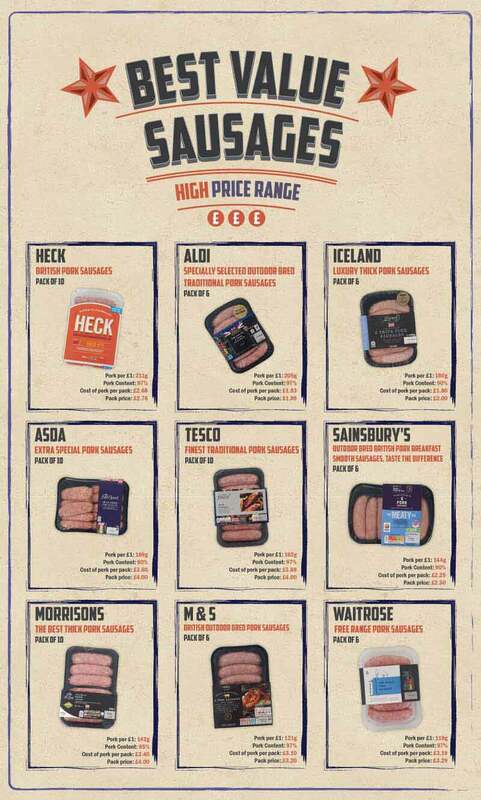 Tesco, Iceland and Aldi have all come top of the sausage charts in new research showing consumers the value of pork sausages. Here at Money Guru we understand that getting your money’s worth and knowing the value of your purchases makes for a happier and more financially successful life. 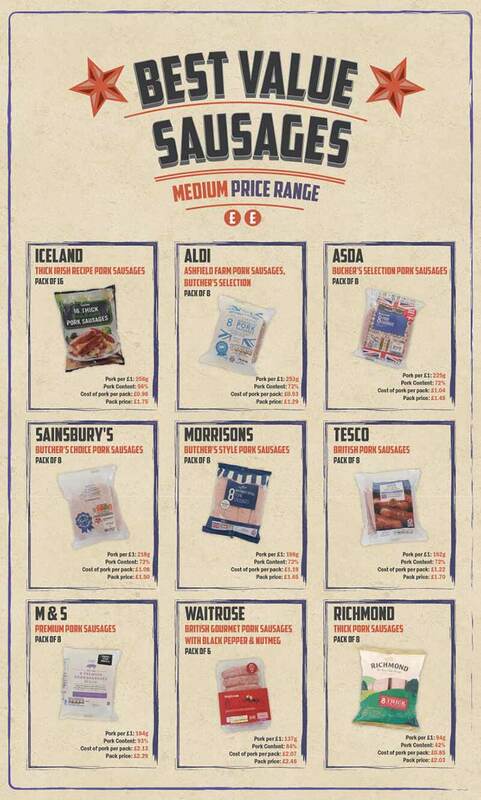 So we’ve searched the most popular brands and supermarkets to find out the best value pork sausages. We’ve looked at low, medium and high price points, working out how much pork you get for £1. 85% of households in the UK buy sausages, at least 12 times a year, spending an average of £31.20 annually. So how do you know which to choose? Is it worth paying extra for higher quality? Are you really getting value for money? 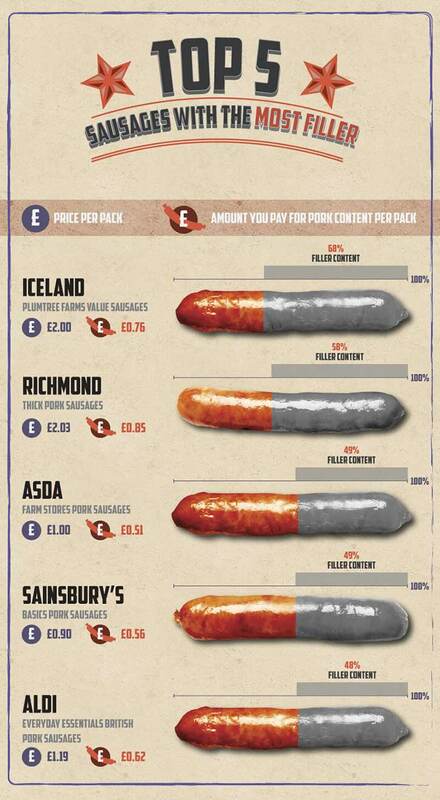 Take a look at our research to see which sausage gives you more banger for your buck. Put another way, a high pork content percentage sounds good, but it’s not necessarily giving you the best value for your money. This is how many grams you’re getting of actual pork per £1 that you spend. It’s one of the nation’s favourite dinners with a staggering 1.26bn sausage meals eaten by Brits each year and as the heat continues to soar this summer, so do sausage sales. But the amount of pork in a sausage varies. In the UK, those labelled “pork sausages” must have at least 42% pork content. The higher the pork content, the better the quality, as the leftover percentage can contain a concoction of fat, gristle, rusk, salt, colourings, flavourings and preservatives. What’s the best and the (brat)worst? Value for money is all important for today’s consumer, but sometimes you’d rather the higher quality, even if it means digging deeper and paying a little more. The higher the pork content, the less filler is in each sausage and vice versa. 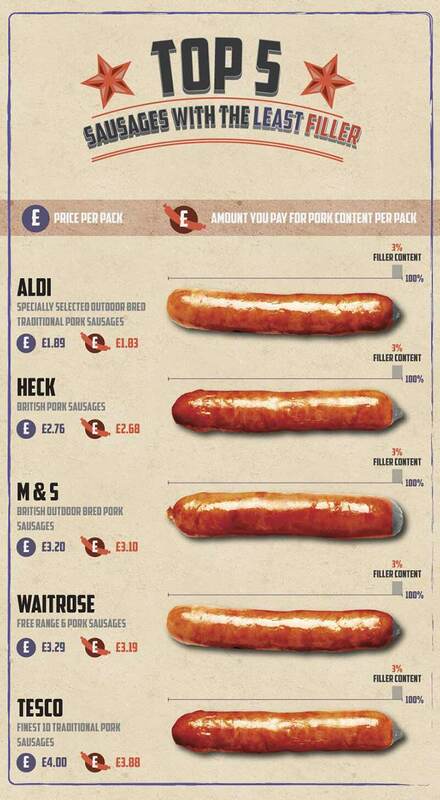 Check out the top 5 sausages with the most and least filler. We’ve also separated each price point into low, medium and high to show which brands give you value for money within that price bracket. If you can stretch the purse strings a little further, you may be able to indulge in a higher quality sausage every now and again. 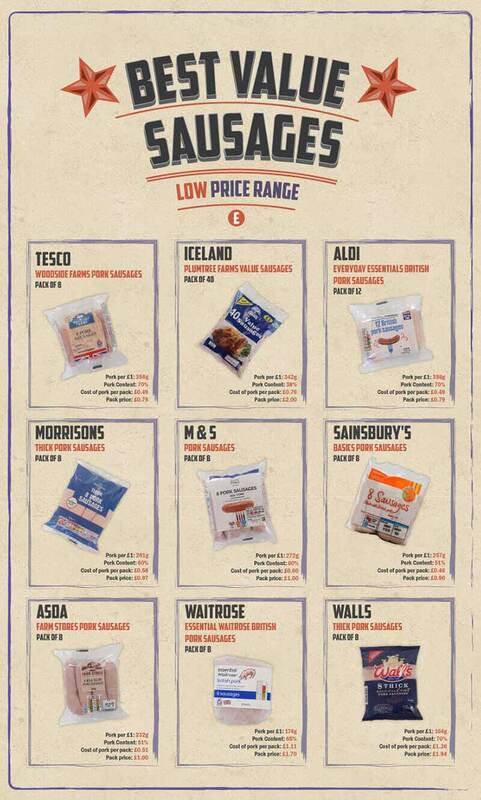 *Average price of brand sausages was taken from 5 leading supermarkets. All prices were correct as of July 2018.